How to Clean Your Warehouse Floor - Kaivac Cleaning Systems and keep your facility running smoothly all season long. Warehouses and distribution/fulfillment centers are simple spaces. Keeping them clean, however, is surprising complicated for a variety of reasons. They're Big: Warehouses and distribution centers are big and getting bigger. Once they averaged less than 10,000 square feet, now 27% of facilities are between 25,000 and 50,000 square feet and 37% are even bigger at 100,000 square feet. And that's just for starters. Fulfillment centers are swelling to colossal size, like Amazon's Baltimore facility, which clocks in at one million square feet. Their New Jersey center is 1.2 million. They're Busy: Warehouses used to operate eight hours a day, five days a week. Those days are long gone. "Thanks to Amazon and other e-commerce giants, consumers now expect their online purchases to be delivered faster than ever before, which means those responsible for shipping and delivery are forced to operate around the clock," writes Ken Ackerman, editor and publisher of Warehousing Forum. Round the clock operations means there's no down time for a cleaning crew to come in and work. There's No One in Charge: Of cleaning, that is. Warehouses have to have clear aisles to work effectively. Obstructions like discarded packing peanuts and cardboard slow movement. Wax-coated label backings on a polished cement floor can be as slippery as an oil spill. Dust and mold can affect indoor air quality and prove detrimental to worker's respiratory health. Yet there's often no day-to-day cleaning protocol in place for warehouse workers. The good news is keeping your warehouse floor clean can be easy. Chosen for durability, warehouse floors are usually made of polished or coated concrete. Keep in mind that some specialized spaces may have epoxy or anti-static floors. Either way both are robust and relatively easy to maintain by design. 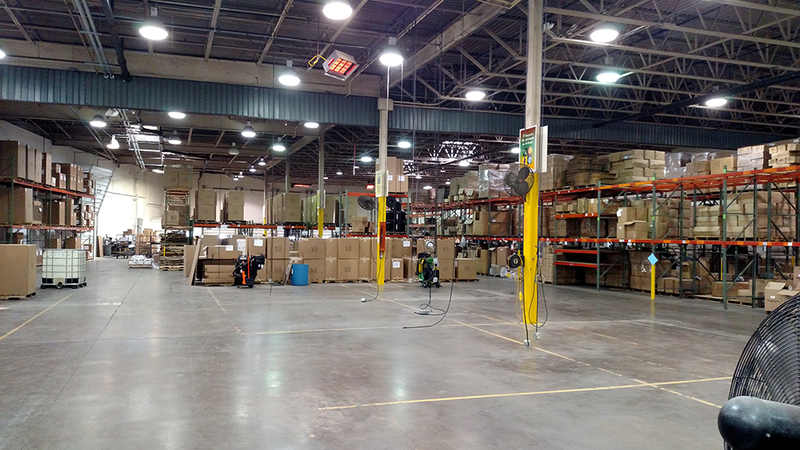 Dry particulate soils present the biggest warehouse cleaning challenge. They account for about 80% of soils infiltrating the environment, according to Richard Bodo, director of training for Karcher North America. Removing them from large, hard surface floors should be easy, as long as staff use the correct tools. The best way to maintain a warehouse floor is to set expectations and assign staff to the task. Create a maintenance schedule and instill a culture of clean in your employees. Let them know that cleaning is an important and valuable part of their job and instruct them to clean as they go. If employees specialize in a certain pick zone empower them with the responsibility to clean that zone. Set the expectation that their zone must be clean and clear before the end of their shift. Give them the right tools to get the job done. The right tools make any job easier. For keeping warehouse floors clean those first tools are a garbage and recycling bins. Install plenty around the facility so staff doesn't have to walk too far to dispose of waste. Instruct them to empty bins before they are completely full to keep them from overflowing. Tackling the majority of soils, that dust, sand and grit that blows in every time the doors open, takes a different approach. Facilities that only use an autoscrubbers for this job might find results less than satisfactory. That's because these fine-grained soils embed into the machinery and turn the autoscrubber's pad into a large sanding disc. Avoid this by removing the soil with a direct throw or overthrow mechanical sweeper first. An even better solution is to combine the two jobs with a battery-powered AutoVac instead. This higher performance technology sweeps, cleans and leaves the floor completely dry in once pass. Faster than an autoscrubber, it can be converted to pick up liquid spills as well. It's easy to use so training is simplified and costs less than other equipment so you get your return on investment faster. Click here for more tips on how to clean your warehouse floor. Knowing how to clean a warehouse floor guarantees that your business will run smoother. With the holidays upon us, warehouses and distribution centers are running full bore, often 24 hours a day. Floors littered with dust, pallet chips, cardboard and other debris will slow output down. Fuel, oil and other spilled liquids can bring the operation to a screeching halt if an employee slips and falls. Protect your people and your business. Know how to keep your warehouse floor clean and keep your facility running smoothly all season long.